probably not going to finish it. 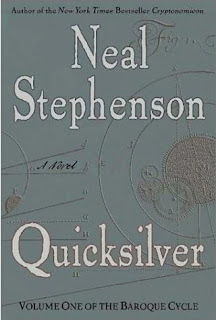 Here’s my first true confession: I have been trying to read the book Quicksilver by Neal Stephenson for nearly a YEAR! My smart brother, his smart wife and their smart daughter have read this stuff and THEY don’t have a problem with it, but try as I might, I just can’t conquer this mountain of ideas. And honestly, I like to read things that I can’t put down. That I just fly through. And this isn’t that. Reading shouldn’t be this hard. 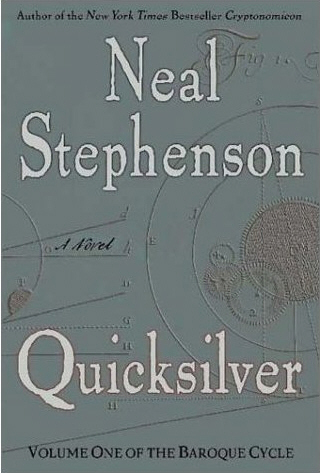 That said, it's a really good book, and when I do read it, I get a lot out of it. I mean, it’s right up my alley as far as topics – it’s historical fiction about guy who lived in the time and place when Christopher Wren and Isaac Newton and all those guys who were reshaping London and England and religion and science and mathematics and … just about everything… and you know how I like to think I’m really thinking about stuff. But this book? I’m sorry, I’m just not smart enough to finish it. I mean, maybe I could… I made myself finish Don Quixote, after all... but I choose not to. Okay, I say this resonated with me, but it would be more accurate to say that it slapped me in my middle-aged-white-lady face. Because I too know this feeling lately – that the world is my pearl-filled oyster and I just have to grab hold of those shimmering, nacreous beauties. And you know why? Because I have found a patron. Or to be more 21st century freelance graphic designer about it, I’ve finally got a couple of good steady gigs that are paying reasonable monthly fees, so that I no longer have to worry each month whether I will be able to cover a decent share of our family bills. That’s not to say that before this, I was exactly suffering or anything… I lacked absolutely NOTHING…although I would have enjoyed more meals out and fewer at-home suppers of beans and rice. I just didn’t like that whole iffy-ness thing that was going on. I realize that many people live like this (and much worse!) all the time, and my heart goes out to them… because I didn’t like it at all. Not one tiny bit. I would love to think I have such a consistently awesome attitude, but as I've just been saying... I don't. To me, being content and in the hole is not as nice as being content and able to meet my financial obligations (and buy the occasional dress). I do know that God is behind any good thing that comes to me, and I'm really thankful... but I'm pretty sure my ever-shifting attitude shows a lack of trust in God as my true Patron. But this is me. A woman who can’t finish a hard book and a woman who likes having a patron, as the guy in the hard book says. And that’s just another example of my essential crappiness I referred to earlier in this post.